The premier destinations for attendees at the Conference that want to improve their health and worksite wellness. Attendees will depart from the Breathe Center informed about personal stress management. 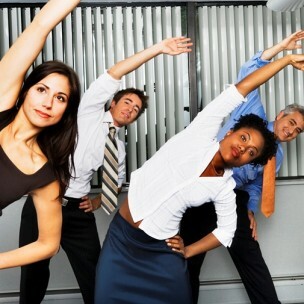 They will be ready to tell their friends and colleagues about their wellness conference experience and have new tools to handle worksite stress. Event guests will leave the Lifestyle Studio relaxed and with a sound education to address their worksite stress and fatigue. It’s a brand immersion experience any advertiser would want to be a part of. Stress & Wellness Education - Two 20 minute worksite classes will be taught in rotation, with 10-minute breaks between each class for personal one-on-one question and answer periods. 3D has budgeted two unique classes, four total classes per day, over a three-day period. Each class will come with handouts, and will offer relaxation and breath techniques that can be practiced back home and on the job. A worksite wellness instructor will teach all classes. A certified aroma therapist designed the breathing scent series, and trained our instructor in the Aromatherapy class presentation. Physician grade essential oils are provided on individual scent strips. Brand Class Environment - Stepping inside Lifestyle Studio, conference attendees will find a serene, comfortable lounge with 10 seats, calming music and aromatherapy sticks. Brand Immersion - The average guest spends 20 minutes engaged with your educational content, scripted instructor and branded classroom.